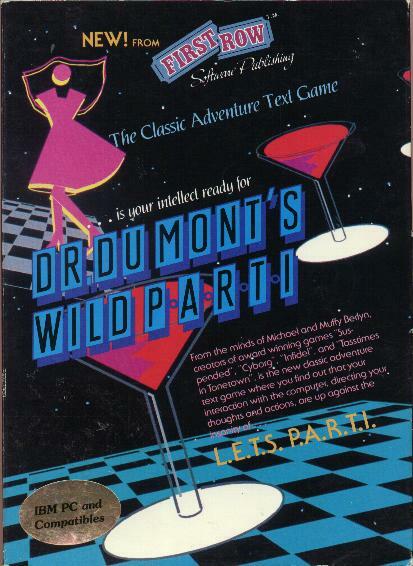 Ye Olde Infocomme Shoppe - Vault - Dr. DuMont's Wild P.A.R.T.I. Okay, wipe the drool off your chin. This was Michael Berlyn's last commercial all-text adventure, written in collaboration with his wife Muffy. Like all First Row titles, it's hard to come by. Berlyn actually presented this as an addition to the Infocom library in the late 1980s, but by that time Activision had seized control and they weren't interested in publishing an all-text game when graphics were the hot topic. An updated version of Dr Dumont was available in 1999 as a straight web download, no packaging) through Berlyn's company, Cascade Mountain Publishing, now defunct. It's likely the updated version is now available someplace for download as freeware.